Once again, I am posting late. I’ve had this written since Sunday but forgot to schedule it for yesterday, and ho hum, here we are. I had to do it myself. 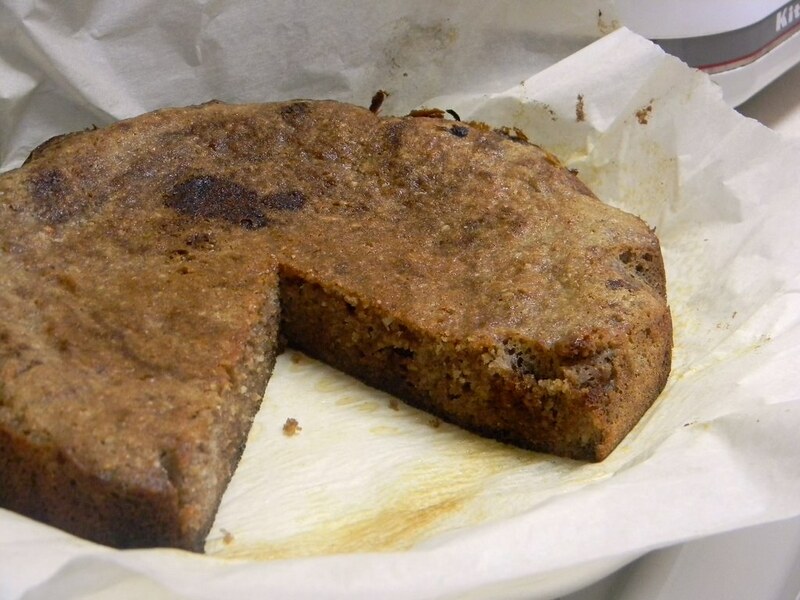 Last year I posted a coconut flour gingerbread cake. It’s a very good cake, although it is almost sponge-like: a trait that, while appealing, isn’t always wanted. This came to my attention after Ariana left a comment on said cake, asking how it could be made less spongy. In response, I quickly typed up an updated version of the recipe – in fact, there upon the spot – which is what I’m sharing here today. (I acknowledged Ariana’s own suggestions in my response comment as well. Haven’t tried it, though.) What is done differently in this recipe is that the egg whites are beaten: I’m not sure if I have discussed it here before, but I’ve noticed that beating egg whites and including the egg yolks, which are beaten to a ribbon stage (more on that later), in baked goods and desserts that use coconut flour creates a fluffier texture similar to gluten-based ones. Beating the egg yolks provides additional leavening as well as structure to the cake that otherwise would be spongy if made with only egg whites. I first came to discover this when I made the lemon (cup)cake for my first entry into Go Ahead Honey, It’s Gluten Free. (Speaking of which, I’ve decided to enter this cake into this month’s GAHIGF. Click here for details.) Needless to say, it is a very desirable result in gluten-free baking. At times, I feel like a scientist in the kitchen when I am observing, placing importance on preciseness and other times an artist when I’m in a groove, following my intuition and just eyeballing it. Although both are creative flows, there is a distinct mental shift between the two. Some people have problems with coconut flour in regards to it absorbing moisture like crazy, but like any gluten-free flour, one just has to learn its quirks – what works and what doesn’t work. What I love about coconut flour is that you need so little because of that! That’s its charm. In my experience, coconut flour doesn’t contribute a coconut-y flavour to baked goods, even when I’ve used it just on its own. The flour doesn’t even really smell like coconut either. 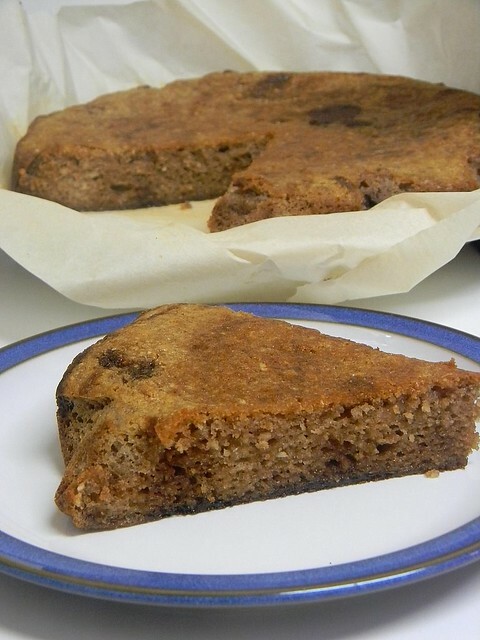 It’s also a great choice for those following the Specific Carbohydrate Diet but might not tolerate almond flour that well, or don’t like having to rely upon it so heavily in baking. It’s still moist, though now with the added benefit of being more fluffy and less spongy. In regards to flavour, yes, it does taste like gingerbread. This isn’t obvious from the batter, which smells more like pumpkin pie, despite there being no pumpkin. (Which makes me ask myself, is it not the pumpkin I’ve been tasting but the pumpkin spice in store-bought pumpkin pies?) I looked up the history of gingerbread out of curiosity and the use of molasses in gingerbread is interesting: while it’s often used in North American baking, in Britain gingerbread is most commonly sweetened with syrup and brown sugar and in Germany, honey is traditionally used in the making of lebkucken gingerbread. (An interesting and informative summary of this can be read on Joy of Baking.) My take on that is that molasses is not exactly necessary to making gingerbread – remember to keep that in mind when you’re out of molasses or want to use something else as a replacement. The trick to this cake is to make sure to stir and fold slowly. There is no mixing involved. If you want a higher cake, I’d suggest doubling the eggs as they generally contribute the most leavening power in baked goods and desserts made with coconut flour. When you beat the egg yolks, the ribbon stage is reached faster if using cold egg yolks as well as when it’s a larger quantity. I made a video a long while ago demonstrating this technique, though I will one day make a new one to include additional info and tips that I’ve learned since, which I include in the instructions below. Adding the baking soda at the very end means that you can take full advantage of its chemical reaction as the cake bakes rather than let it diffuse in the batter as it sits on the counter waiting to be put in the oven. If you’re nut-free, I think that using just coconut flour would be fine – I haven’t had time yet to test it, but I’ll update once I have. *Note that using Earth Balance will no longer make this cake SCD. **Coconut cream is the fatty substance that rises to the top when the coconut milk has settled. To have this stuff on hand at all times, store at least a tin or two of full fat coconut milk (not lite) in the fridge. Preheat oven to 350°F. Line a 9” round cake pan or springform pan with parchment paper. Beat the egg yolks in a small stainless steel bowl with a whisk until light and pale and when visible trail (the ribbon) is left on the surface of the yolks before merging back when you lift the whisk. The consistency will resemble custard, with bubbles. When settled, there is a layer of foam on the top much like when egg whites are beaten. In a medium or large bowl, stir the honey and oil together until the honey is near creamed or begins to have a grainy appearance. Gently fold in the beaten egg yolks. The batter will take on a viscous consistency. Add the coconut milk, vanilla, and spices. All the while, make sure that you are stirring gently and slowly. One at a time, add the almond flour and coconut flour, stirring well and slowly after each addition. Blend well and stir out any lumps. In a separate bowl, beat the egg whites to soft peaks. Gently fold into the batter: spreading the egg whites on top of the batter and cutting a rubber spatula down the middle to the bottom of the bowl and bringing up the batter over the egg whites. Repeat until there is no white left. Do not stir or mix, or else you may expel the air trapped in the whites. (See below pictorial tutorial for visual reference, if needed.) Fold in baking soda last. Pour batter into the prepared cake pan and bake for 30 to 45 minutes. When the cake is done, it should spring back when touched, or when a knife or cake tester comes out clean from the centre. Thoroughly cool the cake before slicing to prevent the cake from cracking. Serve and enjoy! I have got to try this…. without honey or sugar. I will have to use stevia xylitol. Stop by and link up to my Gluten Free Blog linky. Thanks!! By the way, I tweeted this recipe…. Hope you don’t mind. Thanks so much Zoe! I did see your reply! I’m sorry I never got back to you. I’ve been a little crazy these days and I’m way behind on my blog reading etc. I’ve been really busy working and I’ve been baking cookies and such for my family this year—-with gluten and all of course, since that’s what they eat. But I can’t wait to try some of my own treats. This looks like a great one to try! I also wonder if you would be willing to help me convert a recipe to gluten-free, dairy-free, and sugar-free? I’ll send you an e-mail. Hi Ari, no problem! We all know that feeling around this time of year. I’d be most happy to help you convert that recipe! I just saw this on Gluten Free Feed. Love it, it looks amazing! This looks delish! I am crazy for gingerbread. Thank you for sharing your recipe. This looks amazing! Where can I find coconut flour? Hi Cindi, welcome to Z’s Cup of Tea! You can try looking for coconut flour at your local health food store or if they can order it for you, or you could order it online. I generally get coconut flour at Whole Foods but I’ve also got it at Asian supermarkets for a bit less. I’ve used Bob’s Red Mill and Tropical Traditions, Bob’s comes in 453-gram bag and Tropical Traditions comes in a 500-gram container that includes a little scoop. There’s a fine difference between the two brands in consistency and texture of the coconut flour but I haven’t noticed any obvious differences in my baking results. Just bought some coconut flour – I have yet to try it. Thanks for all the info and for sharing this tradition! Hi Carol, you’re most welcome and thank you for hosting! In reading your description of the molasses origin, and flavor, in gingerbread I wonder if you have tried addin mesquite flour to this recipe? I most certainly will. I just received my first bag of mesquite powder. Haven’t even opened it to smell yet. I found the best price at rawfoodworld.com. I will happily share trials and tastes and tribulations. Hi Mary Beth, yes, it is 6 yolks. Corrected!